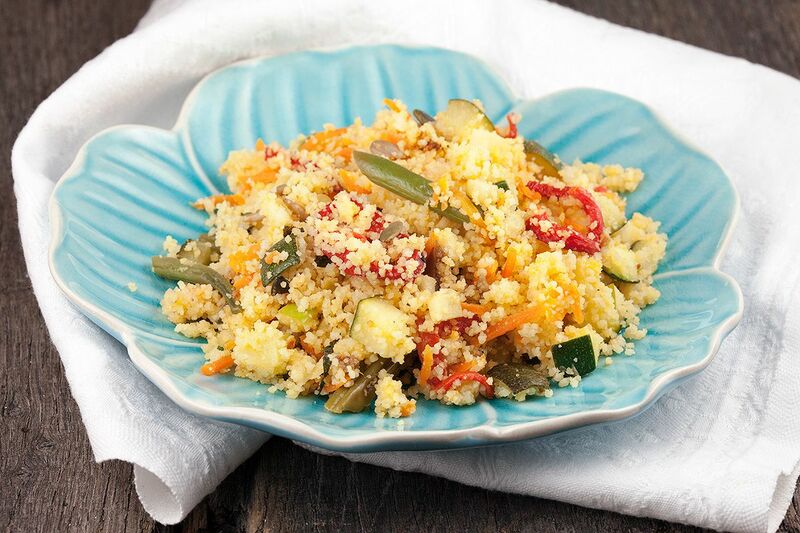 Amazing vegetarian couscous with apple and green beans. Have you ever combined apple and couscous? 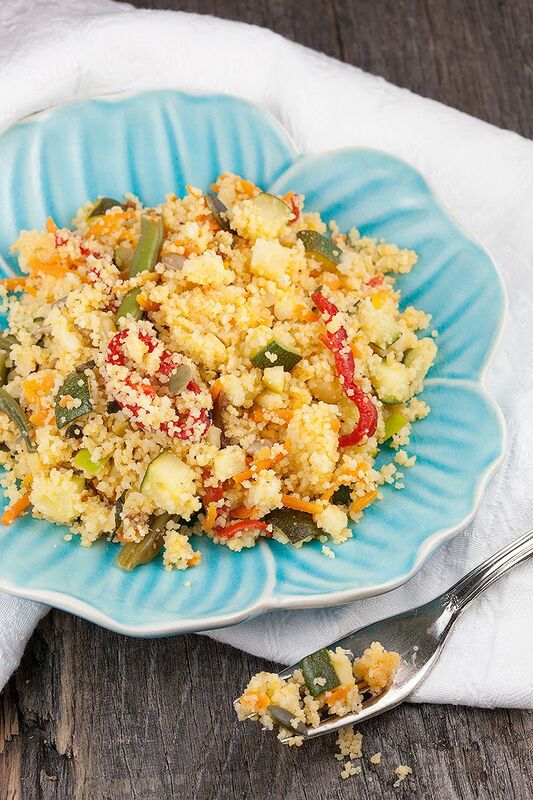 Refreshing crunchy pieces in your couscous, mm! FILL the small pan with water and bring to a boil. CUT the ends of the green beans and chop them in half. COOK them in the boiling water for about 5 minutes and then drain them. PEEL and finely chop the onion and garlic cloves. PEEL the carrots and roughly grate them. RINSE the zucchini with cold water and dive into small cubes. CHOP the roasted peppers in pieces. CHOP the apple into quite small cubes and the dried figs into small pieces. POUR the vegetable stock in the small pan you used before, and bring to a boil. 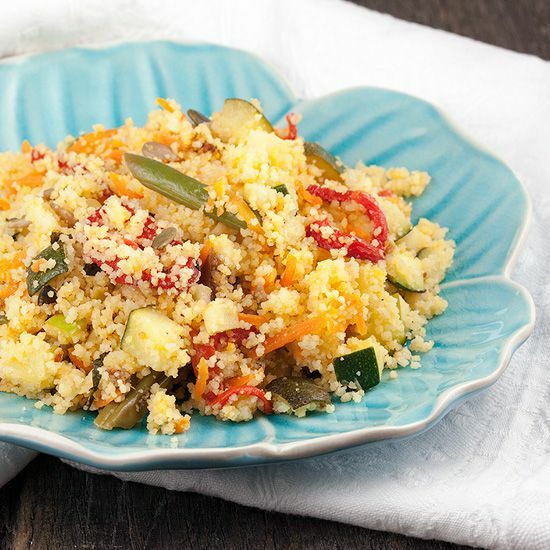 ADD couscous to a bowl and add 2 tablespoons of olive oil, pepper and salt to it. 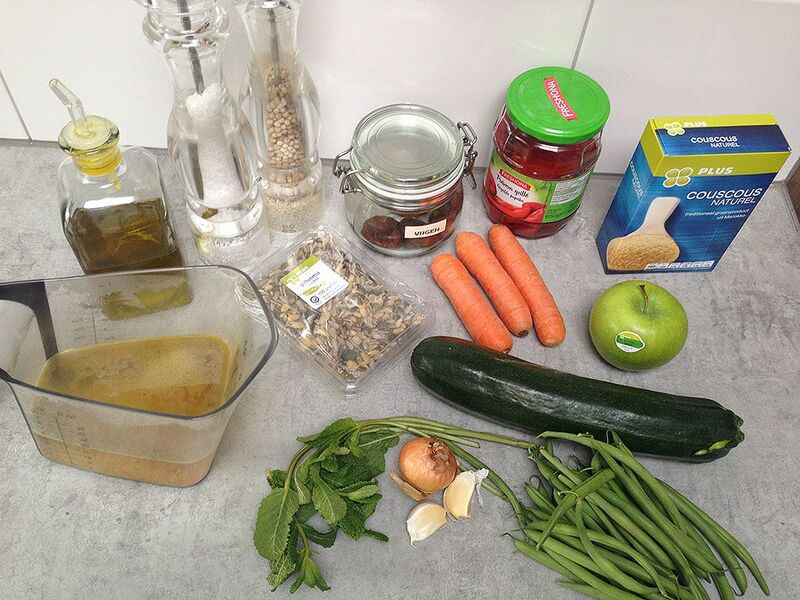 POUR the boiling vegetable stock over the couscous and cover with cling film. This way the steam will boil the couscous. It will absorb all the stock and flavoring for a tasteful couscous. This will take about 10 minutes, immediately stir to prevent it from creating lumps. HEAT olive oil in a large skillet and saute the chopped onion and garlic for one minute on medium high heat. ADD diced zucchini and saute a few minutes more. ADD carrots and green beans. After another few minutes ADD the couscous, roasted peppers, apple, dried figs, seed mixture and keep on stirring so it won’t burn. CHOP the mint leaves and add them to the couscous. Season with pepper and salt. Enjoy! Thank you for this recipe! Love it. I had to make some changes to mine because I didn’t have all the same ingredients, but it still came out great. I used green bell peppers instead of zucchini. I didn’t have roasted peppers, mint leaves, or figs, but I did add some ground flaxseed and thyme. I shared some pics on my Instagram, @vegan_chimes.